In the October issue of the journal PS: Political Science and Politics, a number of social scientists presented pre-election forecasts for the 2012 US presidential election. The January issue of the journal will feature post-mortems from many (all?) of the authors on how their forecasts performed and what we can learn moving forward as a result. The authors of one of these pieces, political scientists Christopher Wlezien and Robert Erikson, were kind enough to share their assessments with the Monkey Cage ahead of time. We also thank Cambridge University Press for allowing us to publish the report here at this time. On August 1, 2012, we prepared a forecast of the 2012 presidential vote for PS. Our model contains two variables: (1) the cumulated weighted growth in leading economic indicators (LEI) through the 13th quarter of the current presidential term and (2) the incumbent party candidate’s share in the most recent trial-heat polls, which were for the month of July. What mostly distinguishes our model from others is the reliance on leading indicators from the quarter ending in March of the election year. The early reading of LEI works well as a predictor because it summarizes growth in the economy leading up to the election year and also provides advance indication of changes in the economy during the election year. The exact equation and the exact forecast change as the poll readings change during the election year. Our forecast published in PS (Erikson and Wlezien, 2012a), based on trial heat polls in July, was that Barack Obama would win 52.6% of the two-party popular vote. This turned out to be quite close to the Election Day outcome, which is 51.4% as of this writing (November 12, 2012). Contributing to the forecast of Obama’s (close) reelection was that the LEI numbers were slightly above the average of the previous 15 presidential cycles. These numbers pointed to some economic expansion during the election year, which did materialize, at least to some extent; what may be most important is that public perceptions trended positive leading up to Election Day (see Erikson and Wlezien, 2012a). The forecasts made at different points in the election year were largely unchanged from this “official” forecast based on July polls. Details are shown in Table 1. 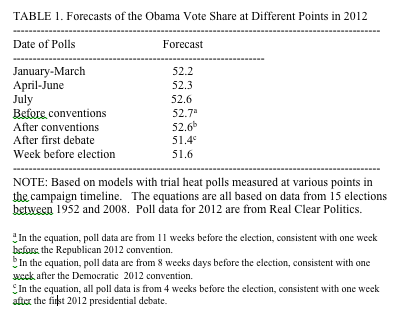 Most notably, the model including our measure of LEI and polls from January-March predicted a 52.2% vote share for Obama. The value of this model with Quarter 13 LEI and Quarter 13 trial heat polls is that it allows prediction of the November vote early in the election timeline, long before trial-heat polls by themselves provide a useful prediction (Erikson and Wlezien, 2012b). We can also check how our forecast prevails if we substitute trial heat polls later than July. Table 1 includes subsequent forecasts that we made, based on equations using recent trial heat polls conducted at those points later in the campaign timeline. There we can see that models of the vote from dates before and after the conventions yielded virtually no changes in the forecast (52.6% or 52.7% Obama). The first debate shifted the forecast of the Obama vote downward, but only slightly. Using a model including polls after that debate, we predicted a 51.4% share for Obama. This is exactly what the president received on Election Day. Acknowledgments: We thank Stuart Soroka for helpful comments. Erikson, Robert S., and Christopher Wlezien. 2012a. “The Objective and Subjective Economy and the Presidential Vote.”PS: Political Science and Politics 45: (4)620-624. Erikson, Robert S., and Christopher Wlezien. 2012b. The Timeline of Presidential Elections: How Campaigns Do (and Do Not) Matter. Chicago: University of Chicago Press. We would have forecasted a nearly identical share only using LEI, that is, without the polls. Professor Sides said that one thing he would repeat was that Romney was not a bad candidate. I think the table of Erikson and Wlezien’s forecasts throughout 2012 would make a strong case.